For years I have had great success with my trusty no-name mag mount 2m/440 mobile antenna. However, it’s time to consider a permanent through-hole NMO mount. NMO product information is a bit misleading so I bought several varieties to figure out the details. I share the results below. Despite the bad rap magnetic mount antennas often get, they do work pretty well for VHF and up (See previous post for details). 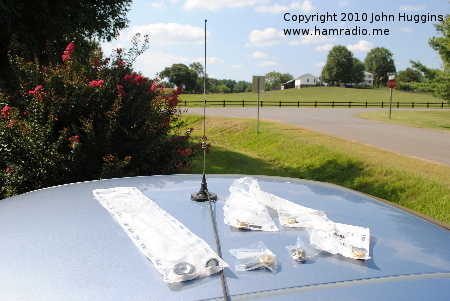 Some web sites mention an issue of liability for materials not permanently secured to an automobile; The suggestion is magnetic antennas are not part of the vehicle unless permanently installed. If somehow your magnetic whip injures someone, auto insurance won’t cover it. I don’t really know the answer to this so am asking the readers of this site to log in and comment on this point. So anyway, the first photo shows the roof of my Taurus in beautiful, scenic Fauquier County, Virginia. Farms, countryside, cattle, horses, even foxes with the view spoiled by the unsightly, ugly cable coming from the magnetic mount antenna on the auto roof top. I never considered punching a hole in the roof of my Ford Taurus. I don’t have anything against this, but mag antennas have, quite simply, always been around to serve my mobile antenna needs. After years of weathering, it’s time to consider a through hole mount on the old Ford Taurus. What, on Earth, am I talking about? I am not embarrassed to say I worked in a popular CB Shop in Fairfax, VA during the college years – 1980s. This was a superb experience. I installed CBs and Antennas in vehicles from compact cars to Firebirds to pickups to Tractor Trailers to RVs. I even designed a CB Antenna for someone’s hot air balloon. The easiest antenna to install was the K-40. However, another popular antenna of the day was the Antenna Specialist “Big Momma” CB aerial. 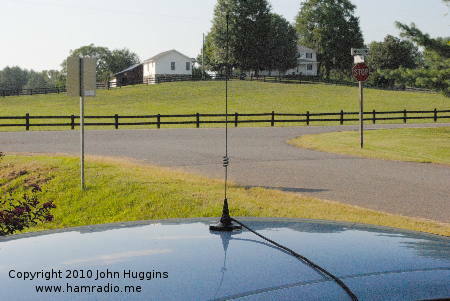 This antenna was once found on every VA State Police car. The key difference between the K-40 and Big Momma twist off mount was the addition of car ground connection whereas the K-40 only connected the coax center conductor. I never quite understood, then, why a base loaded 5 foot whip would need a ground connection. Little did I know I saw my first NMO mount antenna. Back then I thought the NMO mount was an over designed mount. Who needs the ground connection to the whip? If it is a simple quarter wave or loaded short antenna, you don’t. However, if you use a transformer with one end tied to ground, the NMO is the perfect mount to use. Indeed, my further research found that NMO is pretty much the defacto mount used in professional applications for antennas of all kinds. One standard threaded connection provides for an unlimited choice of antennas that one can replace as requirements change. Nice. Current Antenna with various NMO Through Hole Replacements. It is quite clear the traditional installation of NMO uses a 3/4 inch hole. This is precisely what I thought I was going to do. However, I stumbled onto one web site offering a 3/8 inch option and I had to know more. It seems the 3/8 inch option is primarily used for mounts that must attach to very think metal… 1/8″ or thicker. If I can get away with a 3/8″ hole in my Taurus I was willing to try it. Let’s compare the advantages of each. 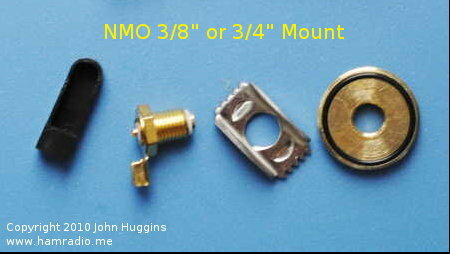 While searching for NMO mounts to consider, I stumbled onto a web site showing an NMO mount with a completely metal enclosed connection area. This is to ensure little RF energy escapes into the human occupied area. Apparently some countries require this. The US does not seem to have such a requirement, but I purchased one of these for review… see below. 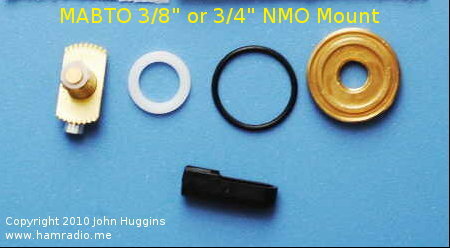 One thing that became obvious after reading the forums about NMO mounts is the suggestion to use brand name parts from Laird, Motorola, Larson, etc. 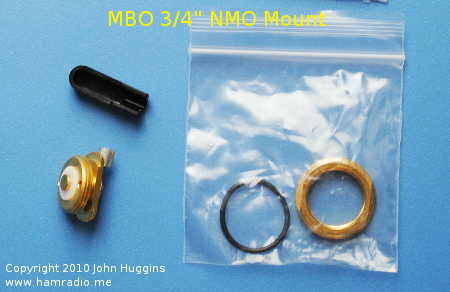 The NMO mount is standardized, but the suggestion is quality tolerances may be loose in off-brand parts. One problem I had while shopping was knowing just what brand parts were being sold. After receipt of my examples, shown below, Laird and Antenex were the primary manufacturers. However, only two of the four vendors said so on their web site and in the sales receipts. No one in the metal industry uses hole saws for small holes like this, however, it appears just about every installer of mobile antennas does. When installing through-hole CB antennas back in the day, the bossman insisted on the use of his metal punch. It did make superb holes requiring very little de-burring. One clear problem with punches is the need for tool access to both sides of the metal. I can see where busy installers desire top only access and the hole saw is about the only way to get it. Fortunately Laird and others make a hole saw specifically for use with NMO installation. The good ones have a pilot drill bit followed by a “wood hole saw” like cylinder and, most important, a shoulder that stops the thing from going too far into your vehicle. I did not see such a tool for 3/8″ installation, but you need bottom access for this anyway, so a punch or carefully used drill may be just fine. One particularly annoying thing with most of the NMO Vendor web sites is the lack of specific pictures for the particular model you are trying to buy. The descriptions were fine, but seeing the thing helps. So for the readers of this web site, here are some pictures of the actual items purchased. I’m not really too hip to that bent metal back support as it feels a bit cheap. The main barrel is for the 3/8″ hole, but the metal back support has too small knockout bumps which help center it in a 3/4″ hole. This unit has a longer barrel for thicker base-plates than the MABO (below). The sales receipt says precisely “Antenex 3/4″ or 3/8″ Hole NMO Antenna Thick Mount MABTO” as did the web site when I purchased it. The Laird bag it came in says this is for a 3/8″ hole. However, the fine print on the bag describes the purpose of the white washer is a centering washer when you use this mount in a 3/4 inch hole. This Laird item may be the “classic” NMO mount. It is for the traditional 3/4″ hole. The top component and backing component are actually just one piece. The backing component has a nice centering cylinder milled into it that looks like it will nestle right into the hole and keep it in place. This unified unit feels and seems very solid. This is also from Laird with the only difference between it and the MABO is the backing piece shape. This one has no 3/4 inch centering ridge milled in it. Both the MBO and MABO Laird mounts impress me. This product contains a 90 degree coaxial connector. The RF energy is obviously well contained. There are only two pieces and the bottom portion is one solid block of metal. I don’t know a lot about the FME connector. Laird (Antenex) easily won my admiration for quality and function. Vendor mis-information and lack of product specifics forces the buyer to do their own research into product selection. I hope the pictures of actual products above help you select the best NMO through-hole for your application. My final choice is likely between the MBO and MABO. Upon close examination the only real difference between the two is the milled 3/4″ circular “shelf” on the MBO inner foot and the size of the threaded connection between the top and bottom pieces. Many reports from the field suggest the 3/4″ MBO style is “much stronger” than the 3/8″ MABO style, but the folks never seem to have any clue as to why. The outer dimensions of the inside foot for each are identical and, thus, transfer stresses to the metal identically. The cylinder of metal between the two is the same diameter. It’s plainly obvious the 3/8″ unit transfers mechanical stress over a larger surface area of vehicle metal with the smaller hole. I will prototype both onto a scrap piece of metal, show it to some machinists and MEs to get their take on this. Several friends note the 3/4 mount offers the benefit of installation entirely from the outside of the vehicle adding… “The entire cable harness with NMO mount can be removed as one piece and reinstalled in another vehicle if you use the 3/4 inch version.” This is a serious advantage and seems to be the practical reason the 3/4 inch version is so popular.